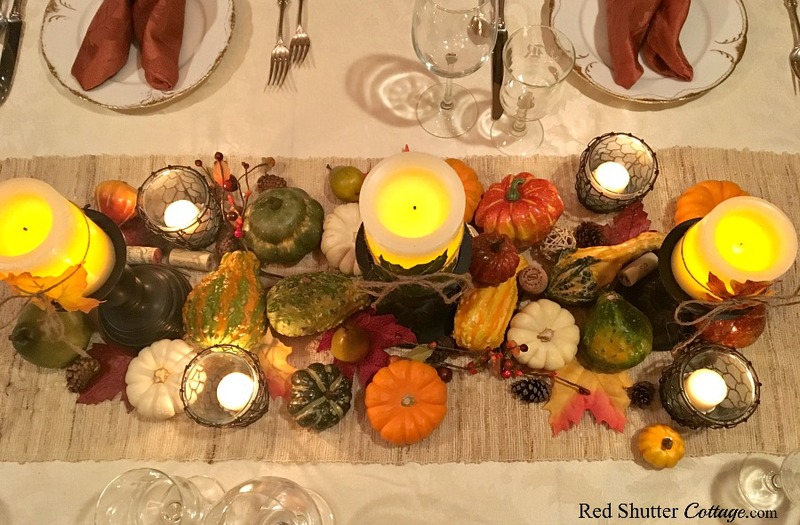 If you are looking for ideas or inspiration for setting your Thanksgiving table, here is a little fuel to spark your imagination. 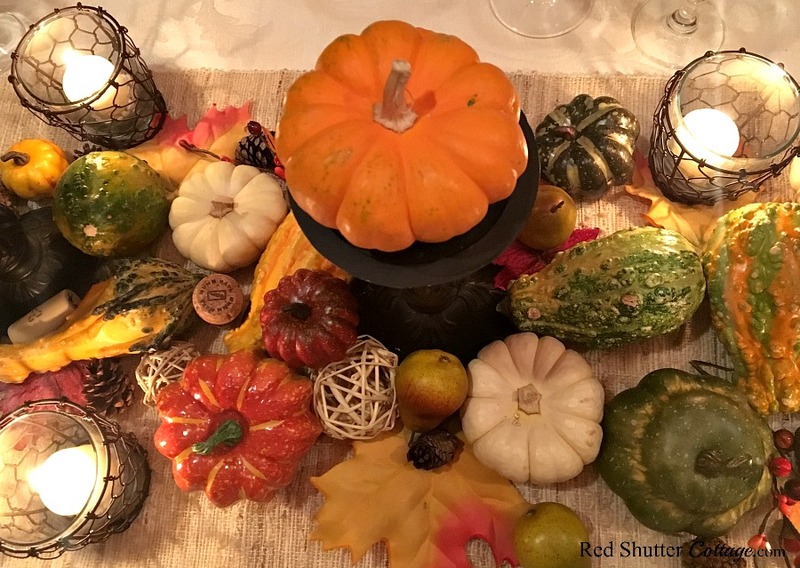 This post will walk you through the steps I take to create a festive, inviting Thanksgiving table. The process is very easy and flexible. 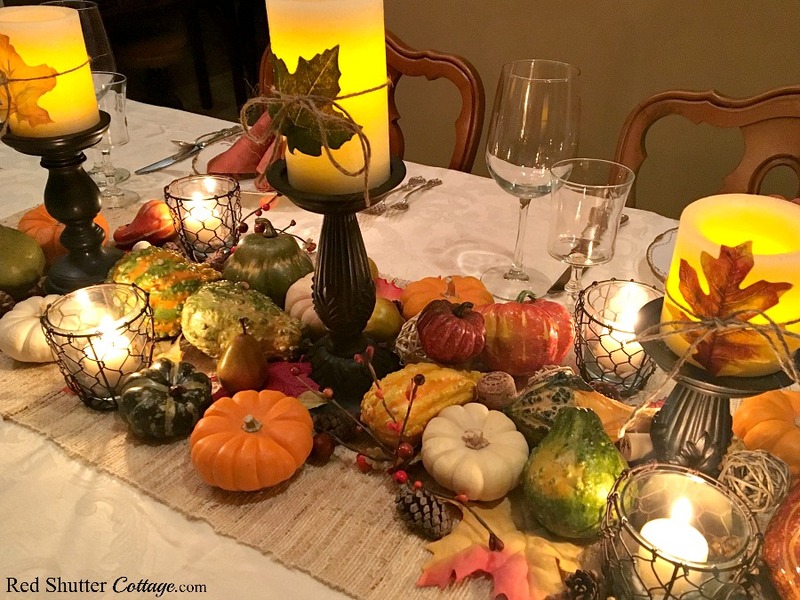 I will offer different ideas and options to consider that I hope will trigger your own creativity in building a Thanksgiving table. 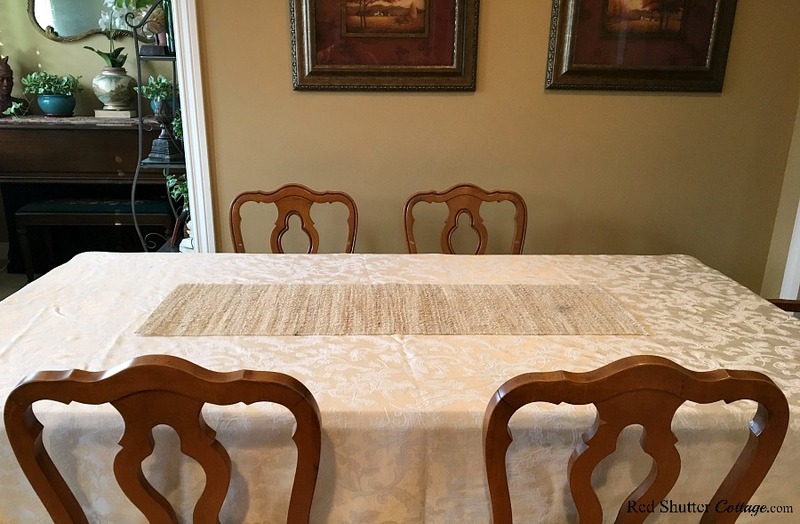 Starting with an empty table….I have put down an ivory colored tablecloth. And yes, if you look closely, there is a soft pattern of holly berry, a dead giveaway that this is a Christmas tablecloth. Nonetheless, I use this tablecloth every single Thanksgiving! I am using the ivory to serve as neutral background. 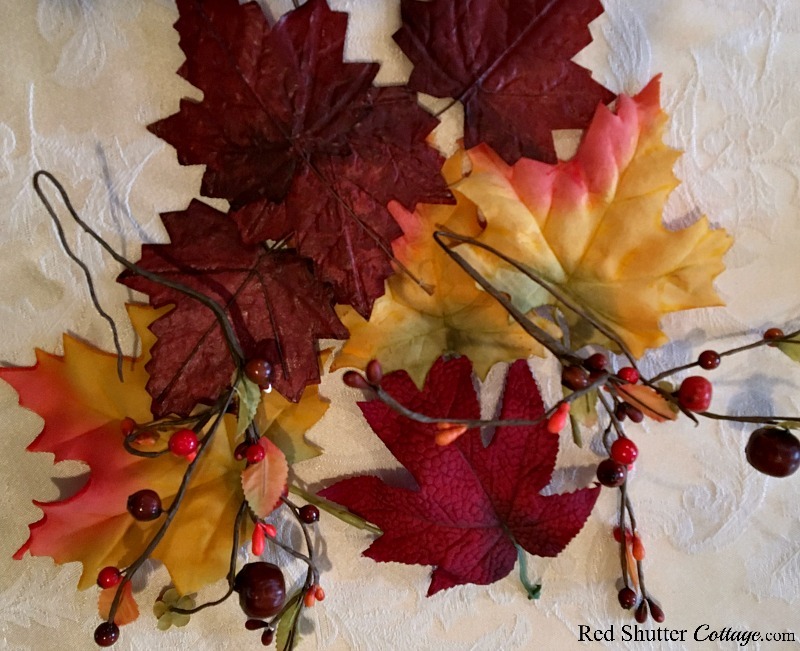 There is plenty of color coming…! I lalso laid down a light-colored straw runner. I have 4 of these runners and I use them year-round. 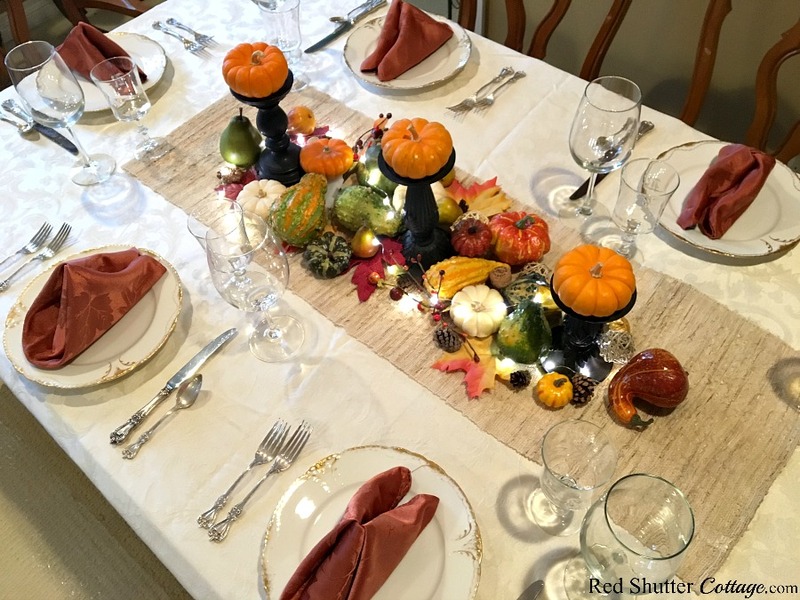 The runner helps to define the space of the centerpiece, but by keeping it neutral, it does not compete with the colors. Plus I love the textural contrast between the runner and the smooth, satiny tablecloth. Here are the basic components we will use to build the centerpiece. I have grouped them together to more clearly define them. 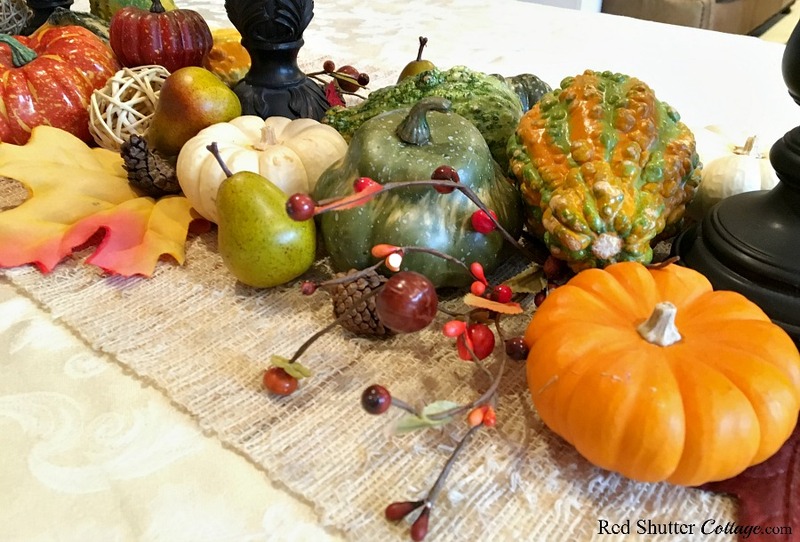 As you can see, there is a mixture of live harvest fruit and faux harvest fruit. But this is not set in stone. Here is an opportunity to use colors and shapes that appeal to you! You may want to use ONLY white baby boo pumpkins. 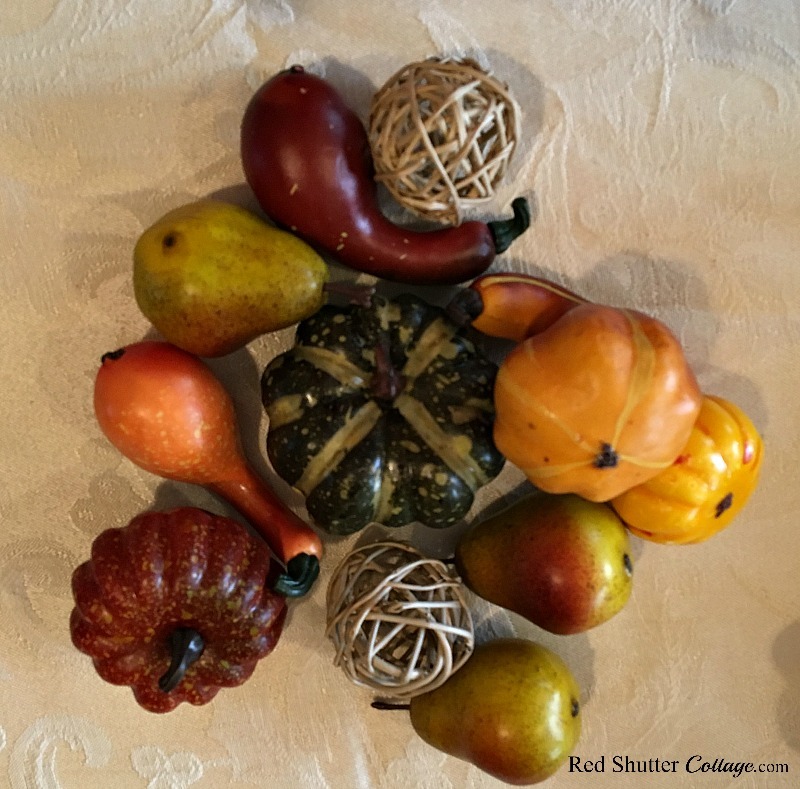 Or maybe you prefer a more well-defined color palate, made up of persimmons, green pears and red pears. Just keep in mind the guidelines to use various shapes and sizes of elements, so that the eye travels easily over your arrangement. 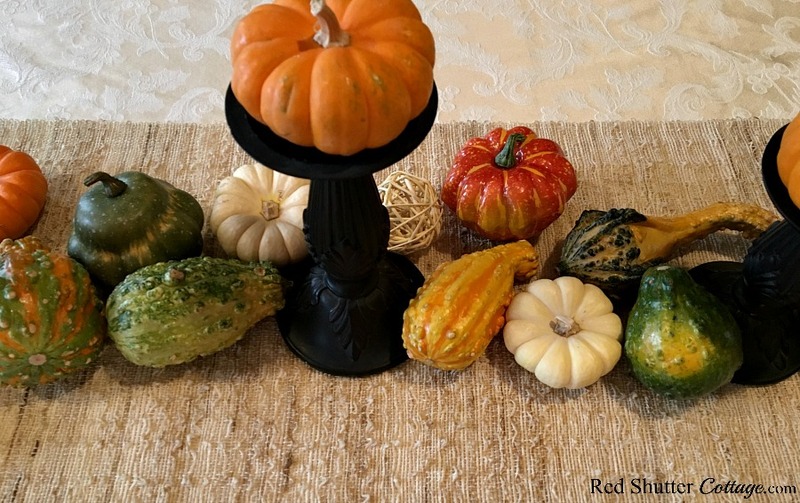 You also see candleholders with a small orange mini-pumpkin sitting on each one. 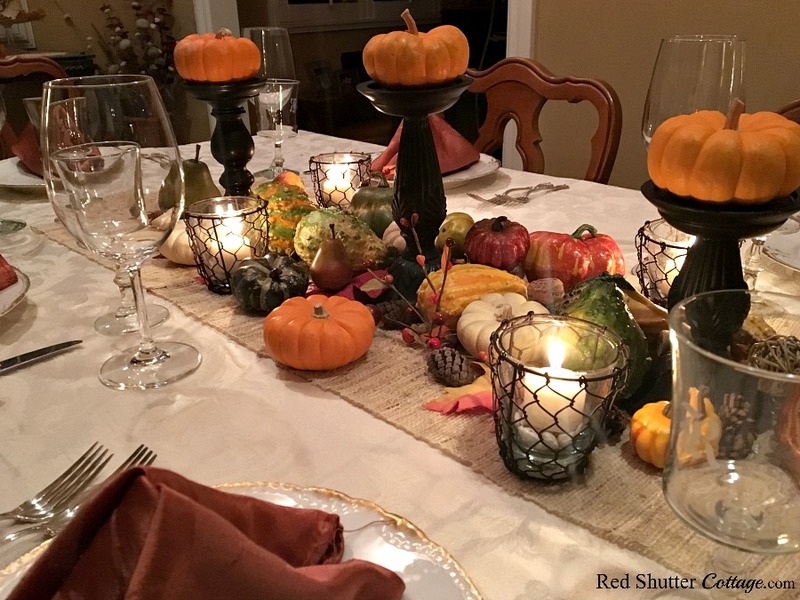 A little further on I will talk about different ways to use these candleholders when creating a tablescape. 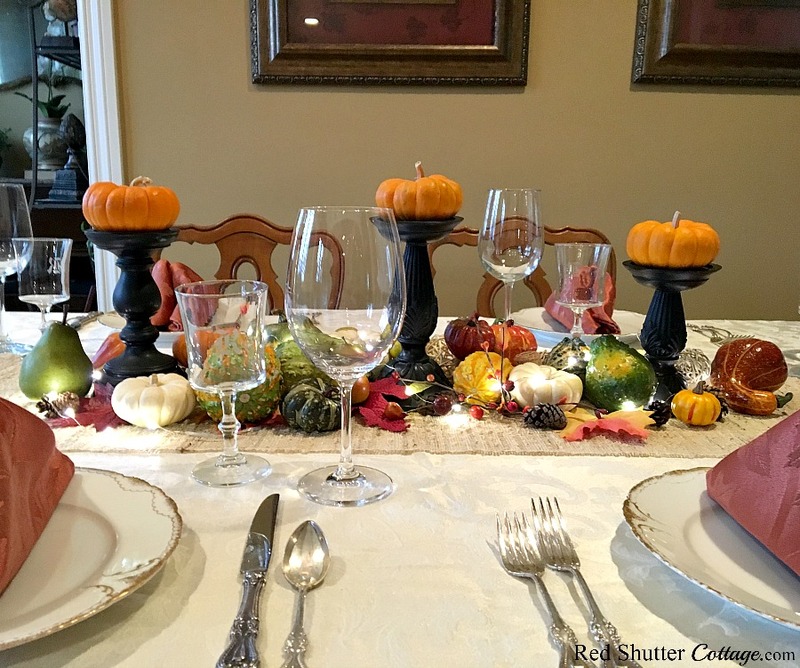 Begin by positioning the large harvest fruit pieces around the candleholders. 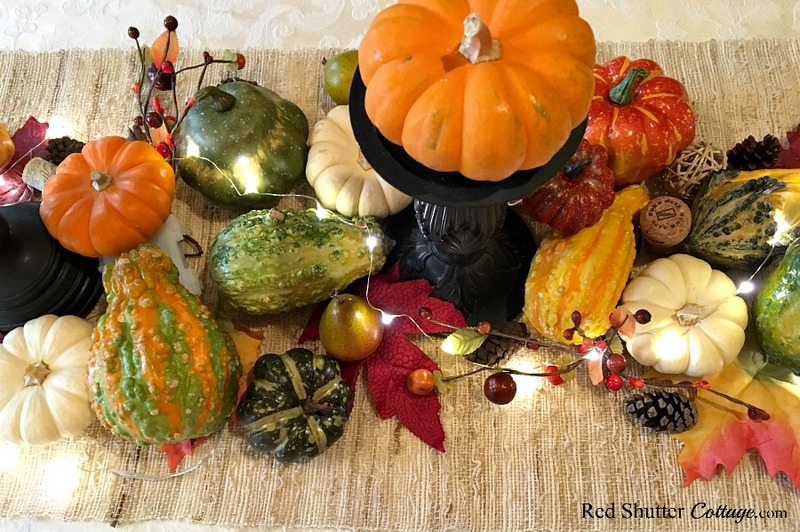 Next, add the leaves and any twigs (these are bittersweet), harvest picks, or fall foliage you may have under and around the large harvest fruit pieces. 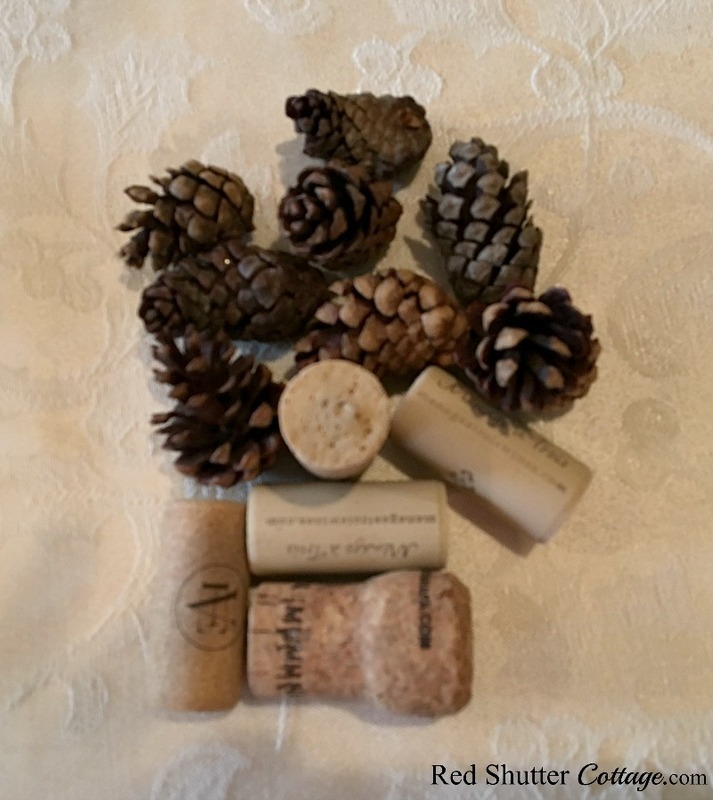 Next we add the medium sized fall fruit, and then fill in any blanks with the pine cones and wine corks. 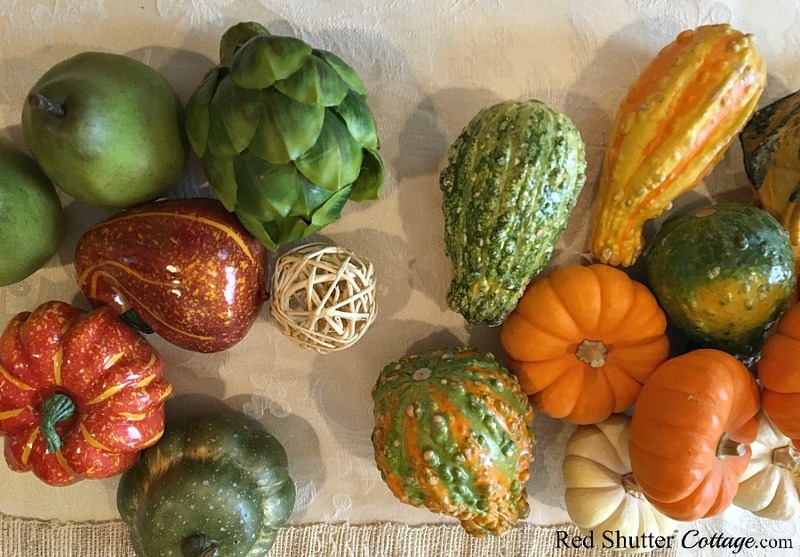 You could also use large nuts still in their shells, acorns, or miniature faux harvest fruit. Next we will focus on lighting. One approach is to weave a strand of the ‘dew drop’ lights through the arrangement. I have purchased them at both Target and at Pier1. Find a place to bury the battery box under the harvest fruit, and then wind the light strand in and around, under and over the harvest fruit, pine cones, leaves, etc. There’s no right or wrong way to do it ! Just make sure you set the timer so you only need to turn it on once! Another approach to lighting would be small votive candles. I came across these chicken wire votive holders on the Piper Classics website, and was utterly smitten. Still I held off, hoping I would come across a sale offer. Sure enough, a 30% off email hit my inbox, and soon I was the proud owner of 4 of them. It’s a well-known FACT that candlelight flatters everyone! 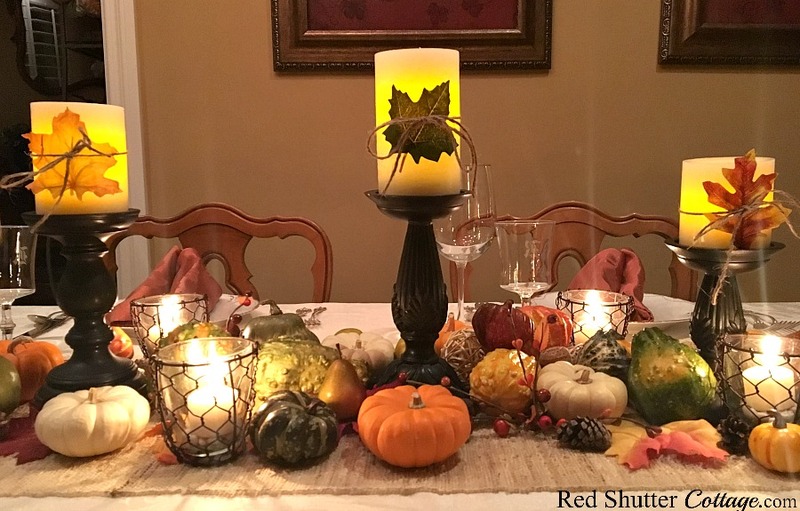 Your guests will no doubt appreciate your thoughtfulness in adding these votive candles to the table. And here’s another option with regard to lighting. 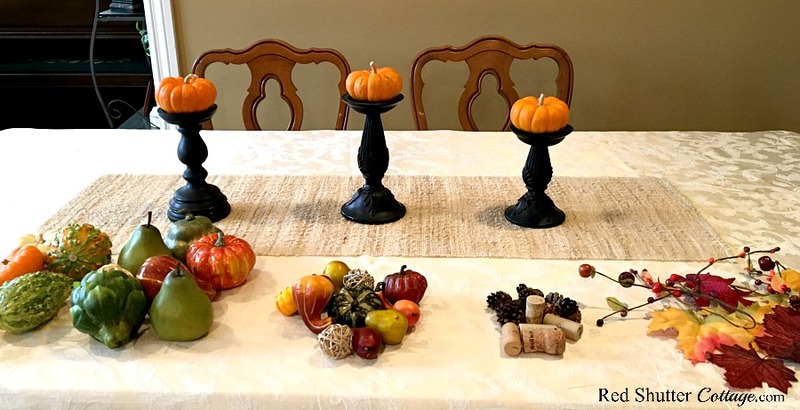 Those candleholders that are holding the mini-pumpkins? Well, they’re actually supposed to hold candles, so let’s give that a try. (I am showing battery candles here, but live candles would be lovely!) I added a leaf to these candles, tied with a little bit of twine. This is just another opportunity to make a creative choice! 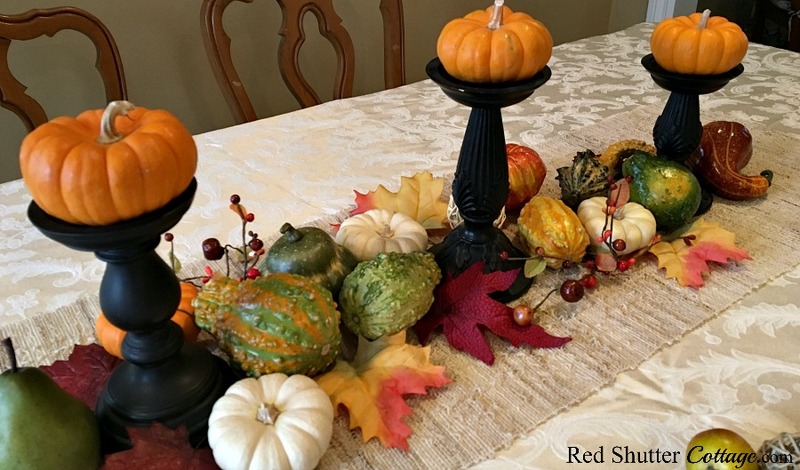 This is how I set my Thanksgiving table, using the beautiful abundance of the fall season, along with my Christmas tablecloth and copper-colored napkins from Bed Bath & Beyond. The plates you see are Limoges. My Grandmother collected them, and for years after she passed, they sat in a storage box. I now use them every single chance I get! The small water glasses came from my Grandmother, too. You may have noticed they are monogrammed with an “R”. She monogrammed everything; towels, purses, little pill boxes, and, of course, drinking glasses! The forks and knives are my Mother’s wedding silver, and again, I use them as much as I possibly can. All combined, it’s kind of an interesting mix of high-end and every day casual. Part of what makes my heart happy is the opportunity to be creative and incorporate unexpected combinations. 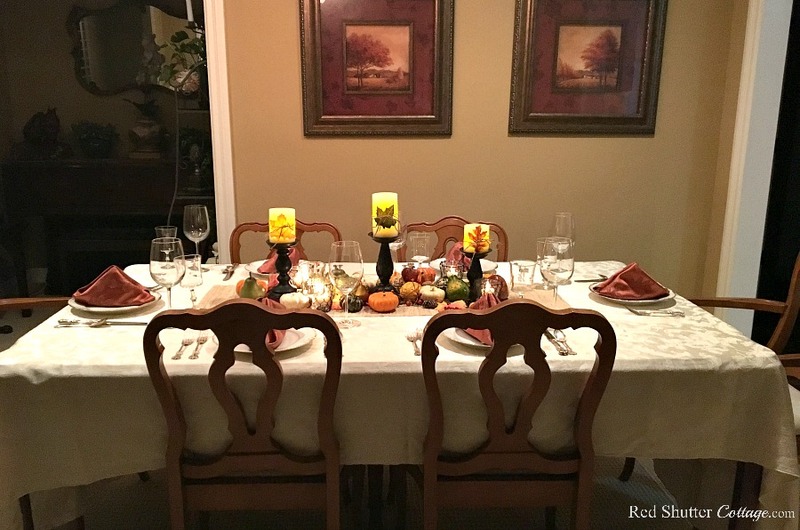 My table is ready and waiting for the most important additions; my family and friends, and our Thanksgiving dinner. 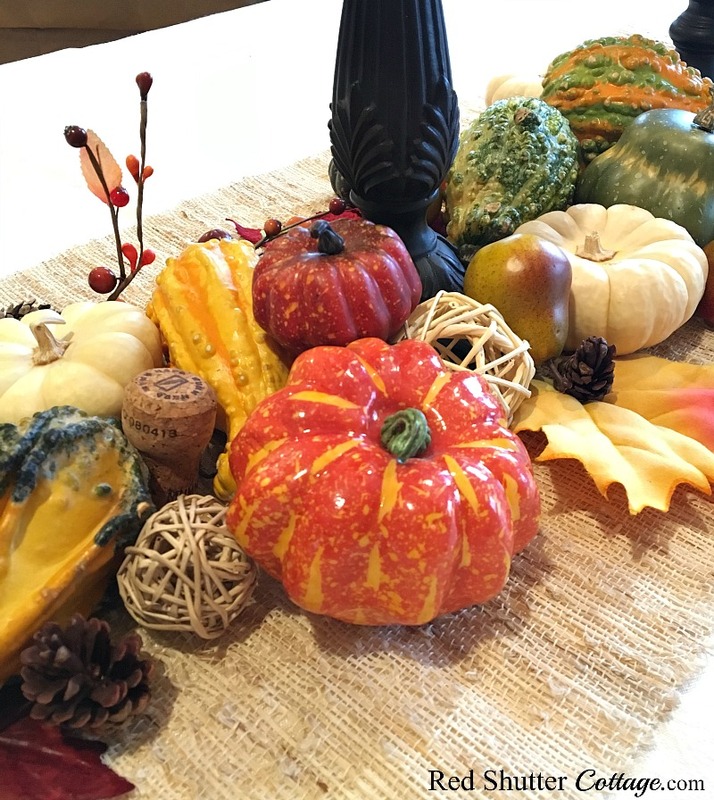 What I hope you come away with is realizing there are so many options and ways to approach a centerpiece like this. 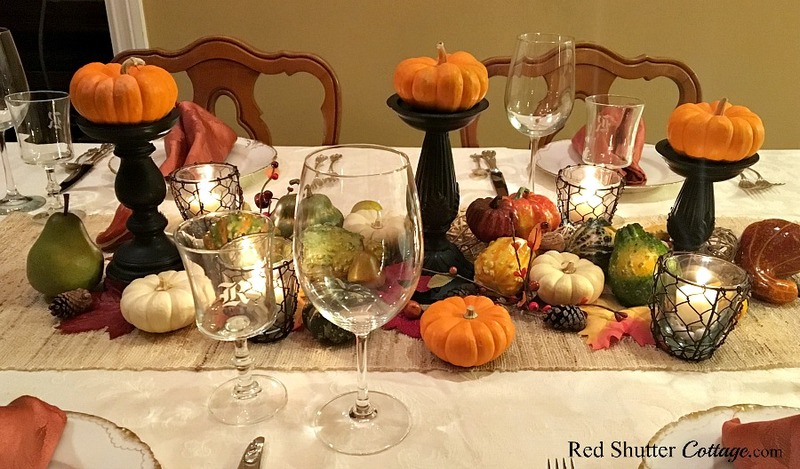 It’s informal, flexible, and offers lots of creative directions for you to make your Thanksgiving table festive and welcoming. 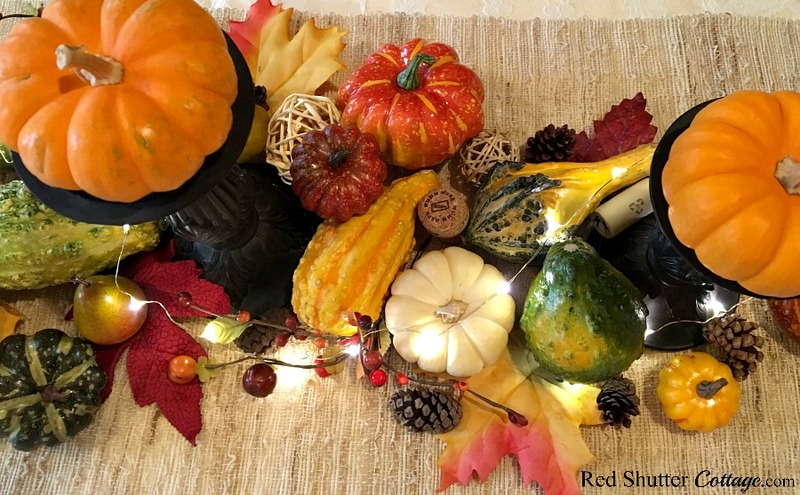 This is a great tutorial on how to arrange a lovely centerpiece runner. 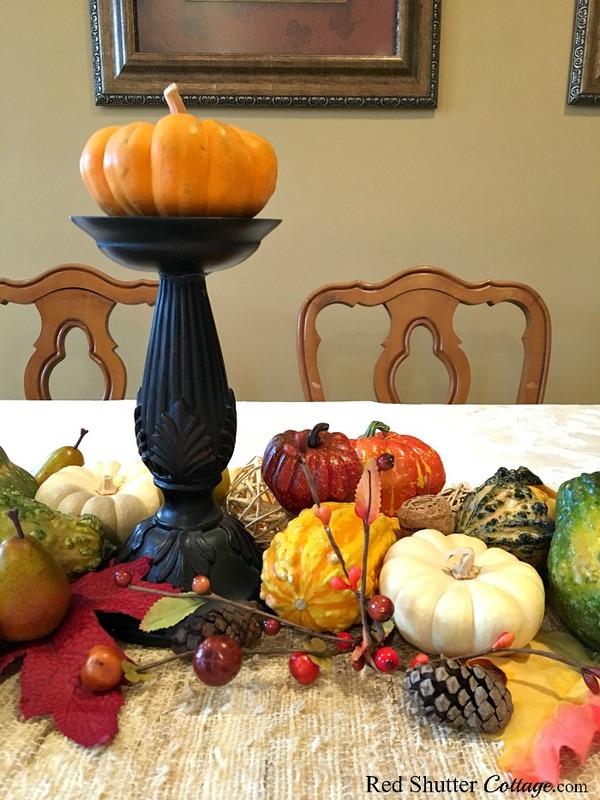 I love using candleholders for all sorts of things too! So fun. Thank you so much for stopping by Bri! And yes, I use candleholders for almost anything I can think of, and some times I even dress them up! I popped over to your site; great site, but more, I really appreciated your message. This is such a great tutorial Kristine! 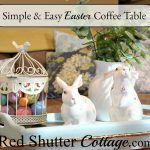 I love how you showed us easy & quick ways to change the look! Fabulous ideas! I love how you’ve kept the pumpkins all natural. They are truly beautiful and I wish we had such a variety where I live! They really don’t need anything added! Your table looks so warm and inviting. Thank you Marlize! 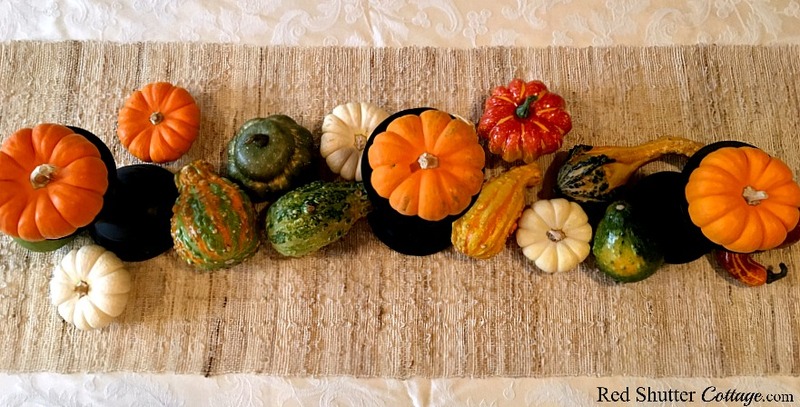 I like to keep things natural when possible; and yes, I do feel lucky to the variety of fall squash that we do have. Thank you Kristy! My hope was to convey how easily we can mix items up and use them in all different ways. I actually had a few more ideas, but was afraid it would turn into a book instead of a post !! 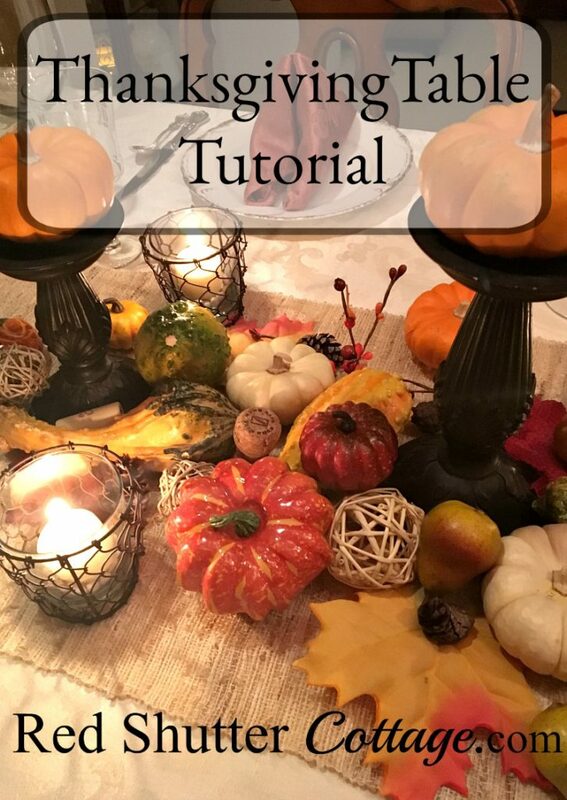 Nice tutorial and lovely tablescape. It’s so nice that you are able to incorporate pieces from your mother and grandmother… they make the occasion even more special. Thank you – and having pieces from both of them really does make it special. I use the plates anytime I get a chance. They spent many years boxed up in storage, so I want to make up for that and use them as much as possible. 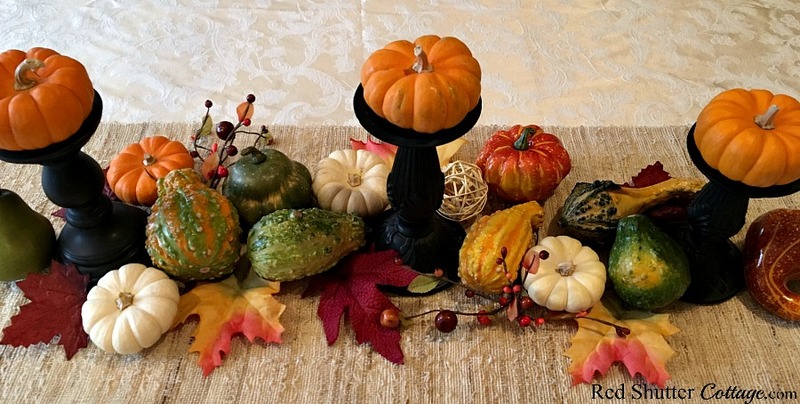 Such a festive table . I like that you used leaves around the candle. What a great idea. Have a nice thanksgiving. The leaves really do help provide a base to define the rest of the components. And goodness knows I have enough of them that I save from old garlands. Thank you for stopping by, Tonita.